Sorry, all tickets have been sold! We’ve had an overwhelming positive response from our community and unfortunately all tickets have been sold for this event. 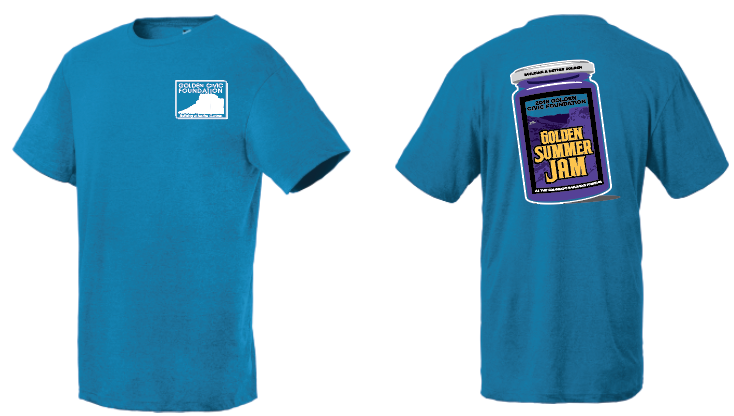 The Golden Civic Foundation is proud to announce that the 2nd Annual Golden Summer Jam will be held on Thursday, July 12 at the Colorado Railroad Museum from 5:30 – 9:30 p.m. and features live music, food and fun for all ages. The goal of this summertime event is to connect with Golden families and residents, promote community involvement and celebrate Golden’s small town, friendly atmosphere. Tickets to the Golden Summer Jam are $20 for adults and free for youth under 18. Each adult ticket includes one complimentary New Terrain beer. We also have super cool men’s and women’s t-shirts available for sale for $20! Table and chair seating will be provided. Guests are welcome to bring their own blankets to spread out on lawn areas. Water will be available in limited quantity and guests are welcome to bring their own water bottles. Due to our special event permit, please do not bring outside beverages and/or alcohol. Sorry, no pets are allowed at the venue. Please note that event proceeds will support the Golden Civic Foundation, a 501(c)(3) Non-Profit Organization. All ticket sales are final and tickets to this event are non-refundable.